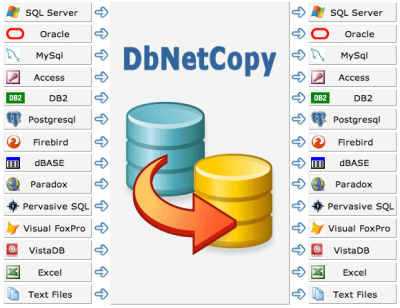 DbNetCopy provides a quick and easy way to copy information between different types of databases. DbNetCopy includes a GUI application that is ideal for one off transfer of data and also an API .Net assembly that allows custom solutions to be created. Supports the following databases: SQL Server, SQL Server Compact, Oracle, Excel, Access, MySql, DB2, Visual FoxPro, dBASE, Paradox, Pervasive, Firebird, SQLite, VistaDB and Postgresql. Simple to use. Just create a connection string for your 2 data sources and copy data in either direction. .Net control with documented API allows you to embed DbNetCopy capabilities into your own application. string SourceStr = @"Provider=Microsoft.Jet.OLEDB.4.0; Data Source=C:\uploadedfiles\transactions.mdb;"